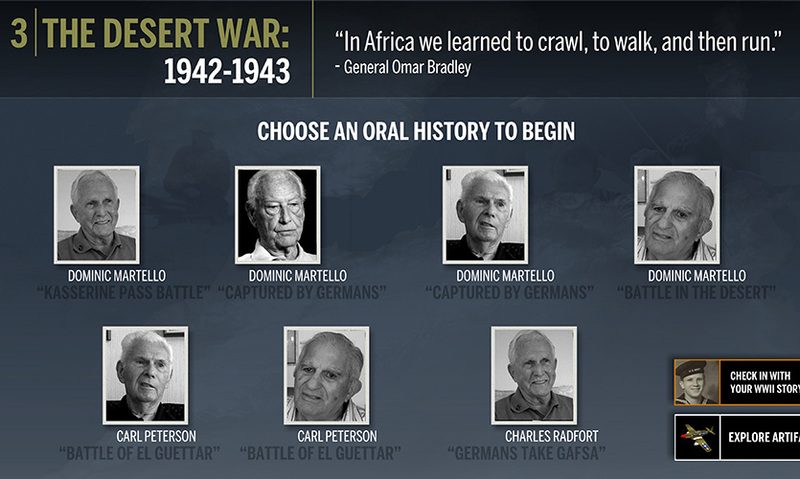 The Dog Tag experience provides intergenerational audiences with a digital introduction to the war. The digital and physical exhibits take guests on an immersive journey through the Second World War. Dog Tag RFID cards allow visitors to personalize their museum visit by choosing to follow the video stories of people who served in the war. Guests can begin their journey by registering their Dog Tags and selecting a character while riding on an interactive train. 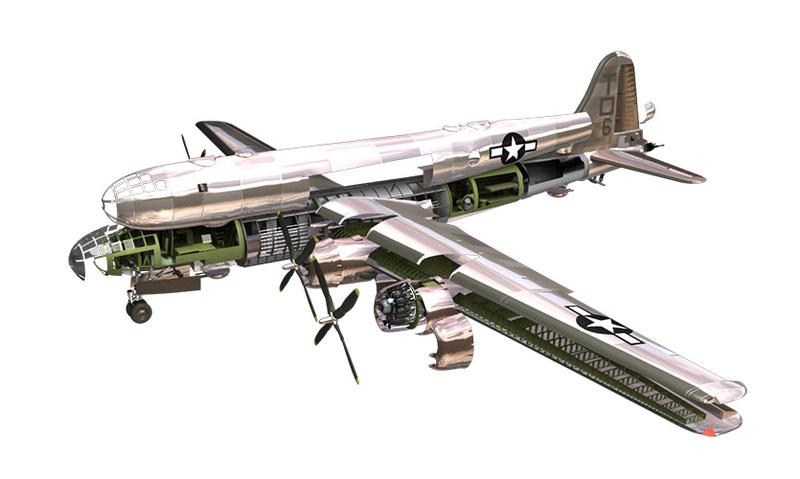 The digital Dog Tags bring home the courage and sacrifice of the war’s participants through oral histories, produced videos, archival footage, animated battle maps, and 3D models of vehicles. War Station interactive kiosks permit guests to explore 3D models of tanks, planes and ships. The Dog Tag Experience allows visitors to take the history home with them. Artifacts and videos can be saved to Dog Tag Cards so that guests can review content through a companion website also created by Unified Field. 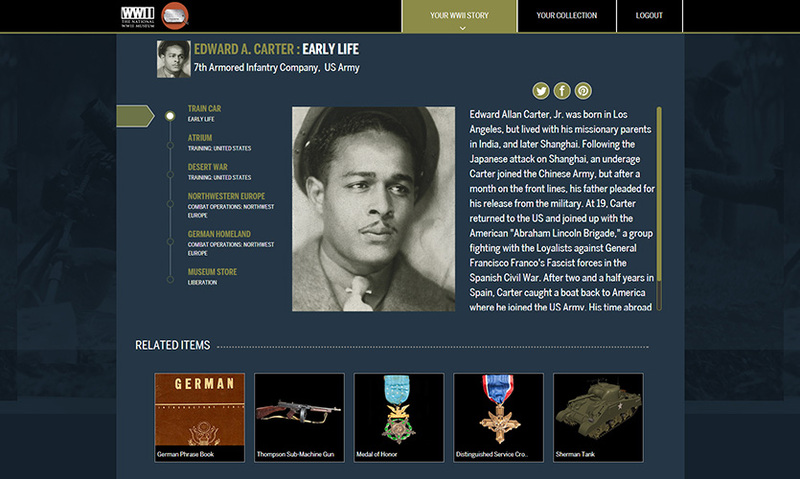 The Dog Tag experience database is fully integrated for mobile and web use. 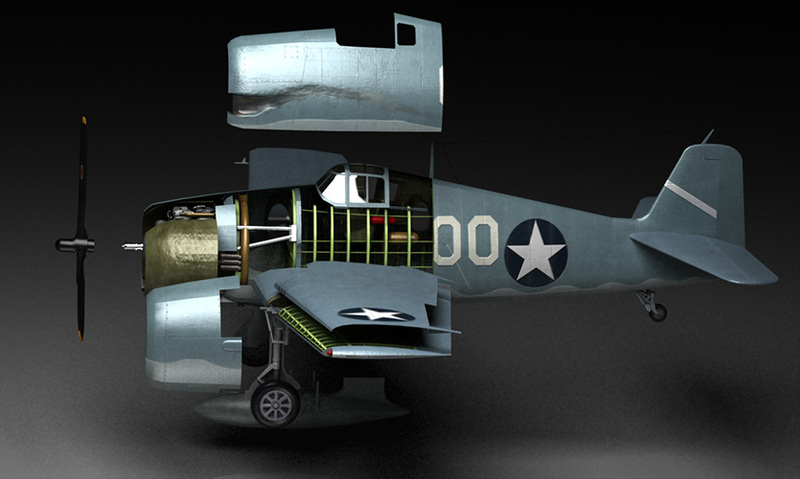 3D models created by Unified Field allow visitors to view the inner workings of vehicles. 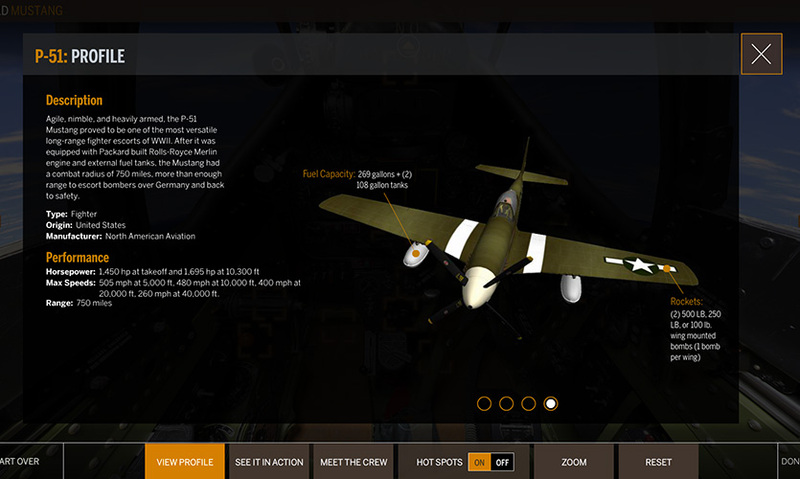 The Flyboys cockpit viewer enables visitors to explore 360 degree views of historic warplanes suspended above the kiosk. In addition to cockpit views, Flyboys kiosks include 3D models of planes as well as oral histories of pilots and archival footage of the plane in action. The National World War II Museum in New Orleans, designed by Gallagher & Associates, was recently ranked #4 in TripAdvisor's Travelers' Choice Awards. The exhibits tell the story of the American experience in the war that changed the world: why it was fought, how it was won and what it means today. Dedicated in 2000 as The National D-Day Museum and now designated by Congress as The National WWII Museum, it celebrates the American spirit and the teamwork, optimism, courage and sacrifice of the men and women who served on the battlefront and the home front. Unified Field (New York City) collaborated with Gallagher & Associates to create the interactive experiences within the Campaigns of Courage Pavilion. 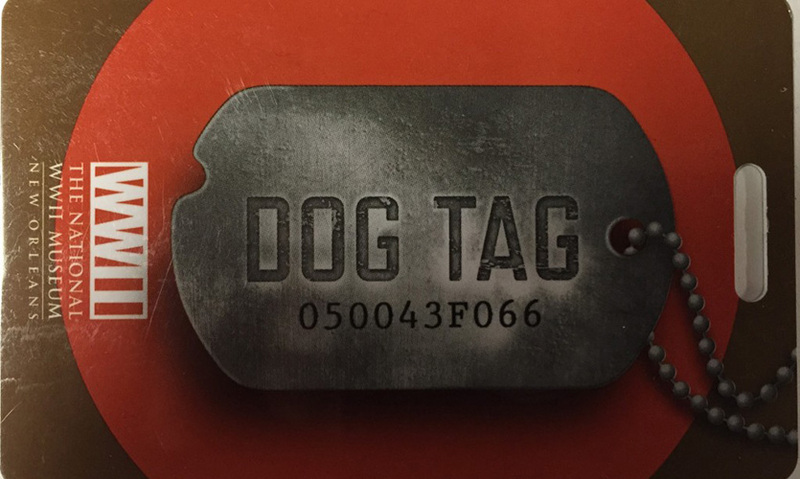 Digital dog tags and flyboy stories are unlocking the real life experiences of veterans of this cataclysmic war through the Dog Tag Experience, a radio frequency identification system. The statistics are staggering: In the first year, more than 570,000 dog tags were registered by museum visitors and 400,000 people provided an email address to remain in contact with the museum. In addition to enabling the in-museum experience, the dog tags allow guests to save artifacts, 3D animations and archival videos to review at home through the Dog Tag Experience website. Unified Field's Greg Peduto spoke with SEGD about Unified Field's work on the interactive part of the exhibits at the Campaigns of Courage Pavilion and how successful interactive experiences there impact the world of experiential graphic design. Tell us about the Campaigns of Courage pavilion, and the Dog Tags, to which your team contributed. 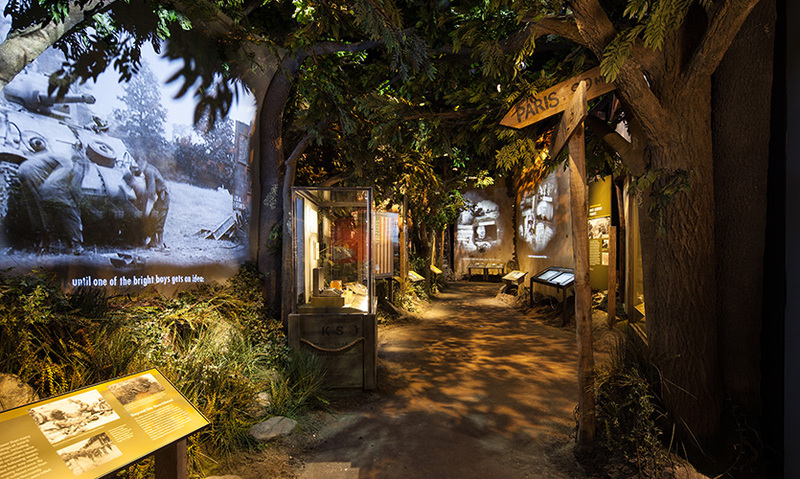 Campaigns of Courage is a truly immersive environment and a thrilling new way to experience the epic story of the war that changed the world. This newest pavilion of The National WWII Museum is 32,512-square feet of space at the heart of the museum. Two immersive exhibits by Gallagher and Associates—The Duchossois Family Road to Berlin: European Theater Galleries and Richard C.Adkerson & Freeport-McMoRan Foundation Road to Tokyo: Pacific Theater Galleries—bring to life the drama, sacrifices, personal stories and strategies of America’s campaign to defeat the Axis powers and preserve freedom. Visitors begin their journey at one of a series of themed interactive kiosks, called Dog Tag Stations, by registering their Dog Tags and receiving one individual’s information, drawn from the museum's vast archives of personal diaries. Visitors learn about their character: where he is from, when he enlisted and why. Guests begin their journey on an interactive 1940's era Pullman car during an immersive recreation of leaving home for the war. They ride from a recreated train station, where most GIs began their journey and are taken across the deserts of North Africa to the streets of Berlin and the islands of the Pacific. From Dog Tag Station to Dog Tag Station, the stories evolve to reveal each individual's true WWII saga. The integrated RFID tracking and database system created by Unified Field enables the interactivity that is the backbone of the experience. What were some of the challenges faced by the interactive design team? 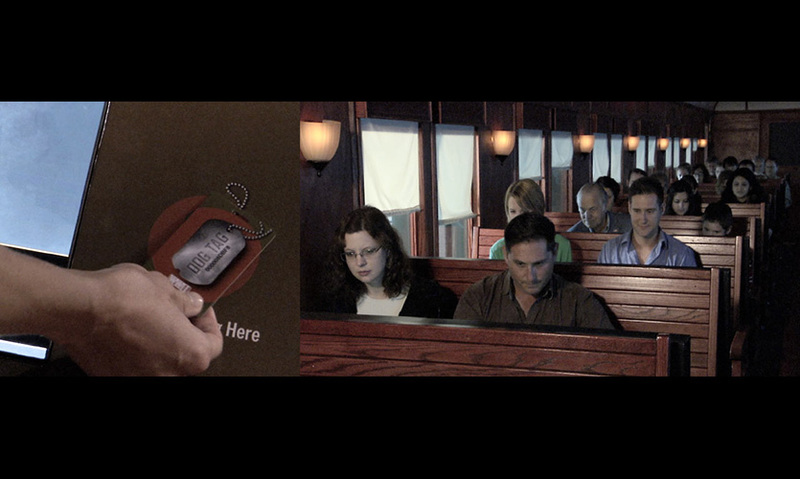 The dog tag RFID system creates an interactive journey within the physical exhibit designed by Gallagher & Associates. 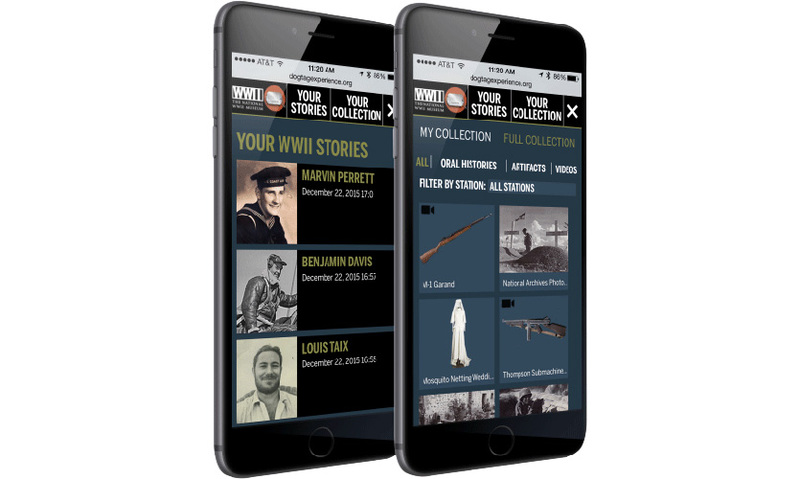 It allows visitors to personalize their museum visit, follow the video story of a real veteran or another person who served during the war, save digital artifacts to view at home and much more. To achieve this level of interactivity, Unified Field managed a vast amount of content in interactive kiosks throughout the exhibit including 560 videos, 100 real characters, animated battle maps and battle narratives, hundreds of artifacts from the museum’s collection, and animated 3D models of tanks, planes and ships that allow visitors to inspect internal features such as engines, bombs and cargo holds. What special conditions or challenges did the interactive design team deal with? Unified Field created a rich database and content management system to enable the interactive experiences. Housed in a central server that links to the museum's website and interactive kiosks in the museum, the database tracks all exhibit content as well as user accounts that are used to save content to RFID cards. This database also tracks historical character biographical information such as rank, unit and service dates, as well as campaigns. 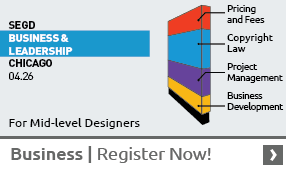 How does the interactive design solution scale or integrate throughout the exhibits? The interactive kiosks tie directly into the physical exhibition space designed by Gallagher & Associates. In this manner, guests can explore North African content while in the North African section or Berlin content when in that section. 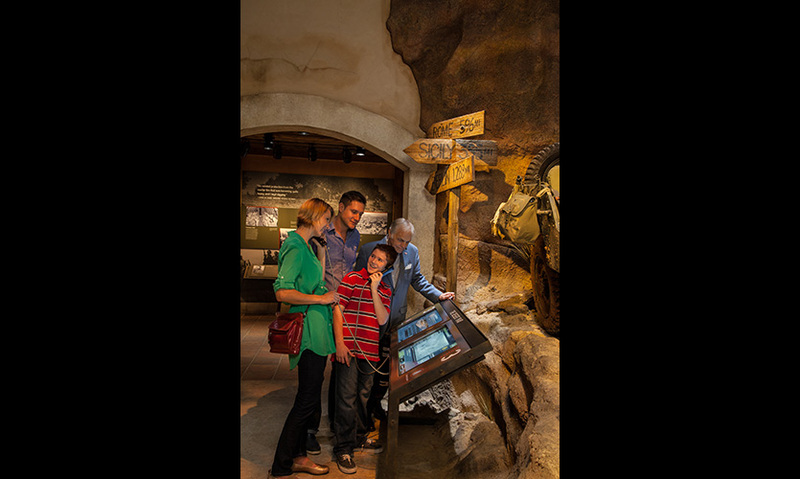 The Dog Tag Experience also allows the exhibit to escape the physical walls of the museum through the Dog Tag Experience website,where guests can review the content they saved in the museum. Furthermore, for each saved piece of content on the website, the database system suggests five pieces of related content to visitors of the website. What else is unique about the space or solution? 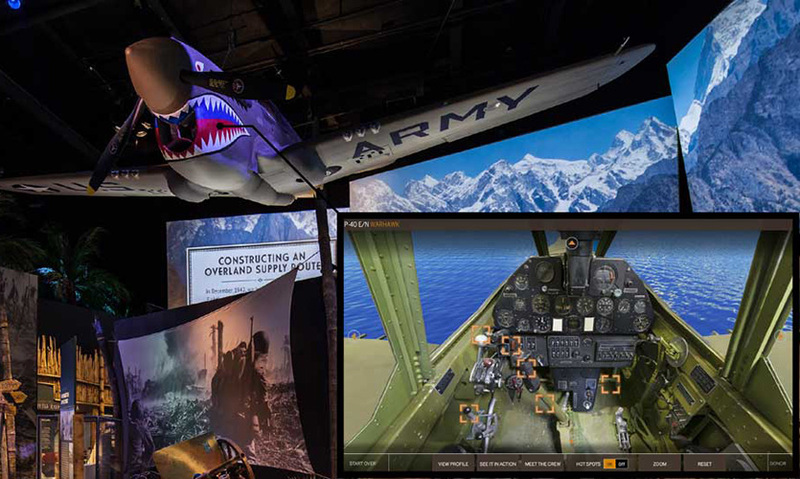 A number of the interactive kiosks that Unified Field created permit guests to explore the cockpits of historic warplanes suspended above the interactive kiosks. “Flyboy” kiosks put museum visitors behind the stick of classic fighter planes such as the Messerschmitt Bf-109, the P-51 Mustang, and the P-40 Warhawk. Positioned near the restored actual fighter planes suspended from the ceiling, Unified Field's Flyboys interactives provide a 360-degree view of cockpit interiors, which are packed with hotspots that explain the buttons, levers and switches. Archival videos show the planes in action while oral history videos transport guests into the hearts and minds of their pilots. To paraphrase Gordon H. "Nick" Muller, PhD, President and CEO of the museum: "the digital dog tags bring home the courage and sacrifice of the war’s participants in a powerful way by connecting visitors to the journey of real servicemen and women. And after leaving us, guests can go online to continue their exploration and discover even more. It’s history that will follow you home."